This version of our prenuptial agreement has the single purpose of enabling each of the new marriage partners to protect ownership of the assets he and she brought into the partnership in the event of breakup. It is a simpler agreement for couples who are independently financially secure before the marriage or partnership, and for whom the concern is the retention of ownership of personal assets such as heirlooms or a business, rather than financial security. The document is drawn to meet the latest prospective requirements for the enforceability of a prenuptial agreement. Nobody enters into marriage or civil partnership expecting it to end. However, all relationships change over time, usually in circumstances that no-one can foresee. Sometimes it is prudent to plan for the worst in the expectation that it won't occur. 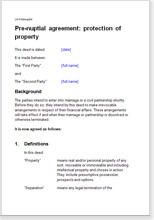 This simple pre-marital agreement states that each party will retain the assets, property and possessions he and she each owned when he and she entered into marriage. It has been written for couples for whom financial support from the other is less important, perhaps because the partners have already accumulated enough wealth during their lifetimes to support themselves independently. The document seeks to protect ownership of that wealth, not to ensure one is supported by the other. Of course, the agreement does provide for assets jointly bought, full disclosure and other elements crucial to acceptability by a court. makes a separation less emotionally stressful by removing the need to negotiate over many things. Is an antenuptial legally binding? Ante-nuptial agreements are enforceable in South Africa. This agreement has been drawn to exclude community of property. Since the enactment of the Matrimonial Property Act 1984, the main purpose of the ante-nuptial agreement has become to exclude community of property. The ante-nuptial agreement must be attested by the Notary and it must be registered with in three month in the Deeds Registration Office. Community of the property means that all assets and liabilities of either spouse will automatically become part of the joint estate upon marriage. Out of community of property means that whatever assets are owned by the parties before or during the marriage remain the property of the individual. If you don’t draw up an ante nuptial agreement in South Africa then your marriage automatically defaults to ‘in community of property. We also stock another antenuptial agreement which covers a much wider range of possible outcomes and which also deals with matters to be agreed during your marriage. That alternative version enables you to define your intentions over broader areas. There is extensive coverage of property, possessions, investments. Children arrangements are included, but covered broadly and shortly, because circumstances at divorce can be very different to those at marriage and a judge will make an order based on what he sees at the time. what should happen if one of you should die.